[138a:0005] [138a:0008] Fingerprint Validity reader devices VFS301 and VFS300 not recognized. Launchpad couldn't import bug #37574 from freedesktop.org Bugzilla. this bugs is concerning the Validity fingerprint reader VFS301. With the command lsusb is listed as: Bus 001 Device 004: ID 138a:0005 DigitalPersona, Inc. This isn't a DigitalPersona fingerprint reader, its "Validity" but they use digitalpersona software. It affects in my case the model HP Touchsmart tm2-2105. On the Bug #285089 there is a patch for the 138a:0001 VFS101 but unfortunately it didn't work on the VFS301. I am using Ubuntu 10.10 and libfprint-0.3.0. It affects HP Pavillion dv7-4012eg and Dell Vostro 3500 too. I tried Fingerprint 1.0 but it not recognize my device. idVendor 0x138a Validity Sensors, Inc.
Is the VFS300 on the dell vostro and the VFS301 originally reported the same? It is a bit confusing. It is not really clear if a solution or a patch for a Fingerprint reader from Validity would work in another one. The patch for VFS101, up to now it didn't work in another Validity fingerprint reader. So it is hard to say if there would be in future a driver for the VFS301, that it would work on the VFS300. But it seems that the Dell Vostro 3500 has the VFS300. On the other bug 138a:0001 somebody declared that the Vostro 3500 had a VFS301. I think it is were the confusion comes. Try the patch for the VFS101, if it doesn't work join the forum. The patch didn't work for me. > VFS101, if it doesn't work join the forum. > on the VFS301. I am using Ubuntu 10.10 and libfprint-0.3.0. Someone have tried to use the patch submitted for Bug #285089 and replace the id 138a:0001 (VFS101) with the id 138a:0008 (VFS300) ? I think it can work ! I tried to change the id 138a:0001 (VFS101) to 138a:0008 (VFS301). It just get recognised by the fprint_demo, but when you tried to enrol my fingerprints, it just doesn't read it at all. You should try if it works on the VFS300 and let us know. I just built with the patch, I only found one line where I modified 0001 to 0005, is there anything else I need to do? It didn't work, but I've heard people say that sudo make install put things in the wrong directories, how do I place them in the proper ones? Thanks! Hi! The fprint dev are working on the driver it basically seems that the patch for the VFS101 (138a:001) just works on the VFS101 and VFS201. On the debug file when you try the driver on the VFS301 it gives errors that we don't know jet what could it be. The driver (or patch) for the VFS101 doesn't work, it was different protocol, register, or who know what else. Even though, I got two email from Validity Inc. insisting that it may work, but maybe it needs some modifications to make it work on the VFS301 that we don't know yet. Let's hope that fprint developers will create soon a driver or that maybe Validity Inc. decides to release a driver for its products. we plan to make it available by April next year. It affects in my case the model HP Touchsmart tm2. The driver for the VFS101 [138a:0001] doesn't work on this device. As 37578 has been marked as a duplicate of this one, let's comment here. The VFS300 [138a:0008] does not work either with the current VFS101 driver. This reader is shipped with the ASUSTEK laptops. I've started developing a driver at https://github.com/andree182/vfs301 . I am able to get some fingerprint from it - but the code still needs some love and integration to libfprint is yet to be done (after it works correctly from console). If someone test this and it works, let me know (through email/project site/this bugtracker). Good news. Thanks Andrej! something that we could start working on and hopefully will become driver for the device. > duplicate bug report (787876). > "Validity" but they use digitalpersona software. > didn't work on the VFS301. I am using Ubuntu 10.10 and libfprint-0.3.0. "No devices found!" (finguerprint GUI). My notebook is HP Pavilion dm4-1075br. Compile (command make) and run the proto (./proto). All steps like a root. I have installed the packages libusb1-0, make and g++. It supposed to compile it without problem. Do you have any suggestion about this? Please, send the last 100 lines before the compile error. > compile it without problem. Do you have any suggestion about this? > this bugs is concerning the Validity fingerprint reader VFS301. With the command lsusb is listed as: Bus 001 Device 004: ID 138a:0005 DigitalPersona, Inc. This isn't a DigitalPersona fingerprint reader, its "Validity" but they use digitalpersona software. > It affects in my case the model HP Touchsmart tm2-2105. On the Bug #285089 there is a patch for the 138a:0001 VFS101 but unfortunately it didn't work on the VFS301. I am using Ubuntu 10.10 and libfprint-0.3.0. Thanks for the tip, but the libusb-1.0-0-dev I have it installed already. Cheers. I've the same problem of carlosv. The issue is related to 64bit infrastructure ? I have the same Ubuntu 11.10 64bit. Maybe it needs to be developed for 64bit as well. Hi there the problem has been just fixed. Andrej is working on it. Thanks. The driver works! Lets hope soon will be full developed. Now, I compile correctly and get image of fingeprint. Good new everyone! :-) The libfprint driver can now be integrated into libfprint and seems to work (see the mentioned web for recent patches etc.) - I was able to compile and use the examples provided with libfprint (and the fingerprints matched when expected). I compiled and installed. fprint_demo GUI. I have installed fprint_demo from repositories. Hope to see it in upstream soon! http://www.reactivated.net/fprint/wiki/Pam_fprint) and it worked perfectly! Authentication on KDE works well. > Great job! Thanks for the effort! > I compiled and installed. fprint_demo GUI. > I have installed fprint_demo from repositories. > Hope to see it in upstream soon! Hi Andrej and thanks for your work. I tried last code from vfs301 and libfprint with fprint-demo and it works well. I attach a shell script to patch and compile libfprint with vfs301 and test it with fprint-demo and it works for me. I hope to see soon this patch in the libfprint git master and fprint stable ppa. I try to install it, but it don't works! If it doesnt work try to use the shell script from PaoloX. If still doesnt work, just tell us a bit more if you get any error on the terminal. My problem was that I had installed the fingerprint-gui package (from yaourt) that depends on libfprint, since, when I installed fingerprint-gui, linfprint be also installed. I installed after fprint_demo from source code. but this did not replace the other libfprint (the lib from yaourt), then, when I execute sudo fprint_demo, it doesn't works. Why make install doesn't replace the other lib? Now download fprint_demo (v 0.04) from http://sourceforge.net/projects/fprint/files/fprint_demo/v0.4/fprint_demo-0.4.tar.bz2/download uncompressed them. Is there another way to solve my problem easier? I mean changing the makefile or something. Good to know that it worked out. I guess the only problem to solved easier is to wait until it's upstreamed. Andrej is solving a problem that seems to affect to certain device with a segmentation problem. So I guess when it will be solve. It will be upstreamed. But good to know it works! Is the problem with fingerprint-GUI? My question is because I installed fingerprint-GUI and doesn't works, it shows me "Segmentation fault" but pam_fprint and fprint_demo work. (process:7580): Gtk-WARNING **: Locale not supported by C library. Ah! that may be the issue I was talking about before. Check: https://github.com/andree182/vfs301/issues/3 . Andrej, any news on this branch and patches? I have checked, I am able to swipe my fingerprints at lockscreen and also when I logout and login. It does not break lightdm. Only problem is I have enter my password to unlock the password keyring after login. Hi guys. I found the reason why it crashes when I try to login using my fingerprints. It is because my home folder is encrypted. I created a user non encrypted and works fine. I encrypted the folder, crashes. Any ideas how to fix that? or do you think it should be consider as new bug? have you tried to do it without fingerprint? yes! password always works encrypted or not encrypted home user folder. Just with fingerprint the login doesnt work. Seems is a new issue (or bug), other people inform about it: http://linux.derkeiler.com/Mailing-Lists/Ubuntu/2012-05/msg00053.html . I will report the bug tomorrow. @Ochir: is there any 32bit package available for the package you provided in #51? @carlosv I've the same issue with encrypted home user folder. Well here is the bug report: Bug #998367 of the encrypted home user. Coming back to the issue I believe this driver works relatively fine. But Ochir is right, the segmentation fault bug in this driver should be solve before merging to libfprint. Now, I believe that Andrej has abandoned the project, so I guess if anybody has an idea how to solve it, just commented. I tried the driver with Fingerprint GUI. The "segmentation fault" crashes the program. We really have to solve this issue. I tried this on HP Pailion DV6 with 138a:0005 VFS301. It works great. > I tried the driver with Fingerprint GUI. The "segmentation fault"
> crashes the program. We really have to solve this issue. Thanks to your help here, I managed to have my HP Pailion DV7 with 138a:0005 VFS301 working on ubuntu 12.04. Today I wanted to try on an extra partition ubuntu 12.10. I used the "make.sh" script found above but had no luck untill now. Did anayone manage to get the driver and fprint_demo work on ubuntu 12.10? This is Andrej's patch taken from github and applied to libfprint. I can confirm that fprint_demo works with this patch on my laptop. could you tell me which version of libfprint should I apply this patch ? > could you tell me which version of libfprint should I apply this patch ? This patch should apply to git master. Thanks , fprint_demo is able to recognize the device but still gives error that it could not open the device. BTW I tested with a VFS300 (Dell Vostro). Guarav, do you have the 300 or the 301? Thanks for your reply. I am using HP Pavillion DM4 with a VFS 301 device. Is there anyway I could make it work on this device? > there anyway I could make it work on this device? Note I am not the author of this patch. So it may be working for the 300 but not the 301. I don't know what the author tested it with. Hi, I tried the patch provided on that forum and it worked! Now I am able to get fingerprints. Any ideas on how to use it for authentication? 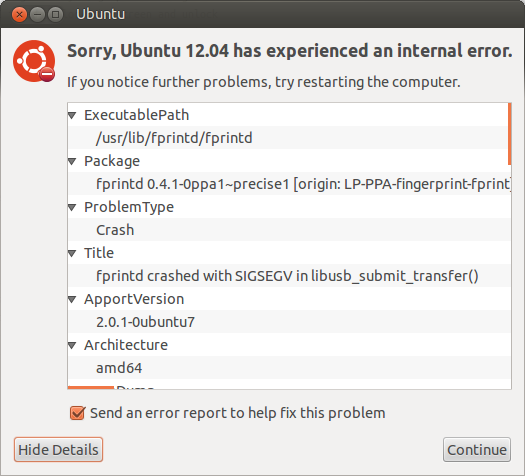 I am using Ubuntu 12.04. I tried using fingerprint-gui but it crashes with segmentation fault. fprint_demo is working. > fault. fprint_demo is working. Yes. The problem with fingerprint-gui is a segmentation fault not yet solved. In order to use it, you have to unistall fingerprint-gui. Since Ubuntu 11.10 the system integrates the fingerprint authentification without using other fingerprint-gui. And that way it works with this driver. So to login and authenticate you must have Ubuntu 11.10 or 12.04, uninstall fingerprint-gui. Then reboot the system. Then to access the "Ubuntu" fingerprint go to: System setting -> User accounts. In the users account window you will see the option "Fingerprint Login" on every account. Click the button and register your fingerprints. You will be able to login and use authenticate when root privileges are needed. P.D. The fingerprint login unfortunately doesn't work if the home user folder is encrypted. But that is not a problem of the driver, is a Ubuntu (or linux) bug. > Yes. The problem with fingerprint-gui is a segmentation fault not yet solved. > In order to use it, you have to unistall fingerprint-gui. > without using other fingerprint-gui. And that way it works with this driver. > fingerprint-gui. Then reboot the system. Then to access the "Ubuntu"
> when root privileges are needed. OK. I tried that method ,but I couldn't find any fingerprint login option in that menu. I am using Gnome3 with Ubuntu 12.04. I tried modifying /etc/pam.d/login but its not working. Could you suggest me some method for doing the same. Unfortunately at the moment there is not other method. To use the fingerprint-gui we must wait until somebody solves the segmentation fault. Now, I really find strange that you do not have this option in the users menu. I tried in Unity and Gnome and both are there. I attached a screen-shot of how you supposed to find it. Make sure you installed the fprint .deb customized from the forum. Hope it helps. > from the forum. Hope it helps. > > from the forum. Hope it helps. The driver is for the devices 138a:0005 (primarily) and 138a:0008 (some users reported it as working too). The device on my notebook contains a LED next to the scanner, but I also didn't yet figure out how to control it - but anyhow, can libfprint use it to provide some feedback, even if we know how to control the LED? I tried your updated patch with 138a:0018 Validity Sensors, Inc. on HP Pavilion dv6-6030er. I tried to change id 0008 to 0018 in sources. fprint-demo finds my device, but cannot open it. If I can help you to make your driver work for 0018, tell my what I should de. Unfortunately, I don't have Windows, so I cannot send you any reverse-engineered stuff. > Hi, Andrej and Everyone! > cannot send you any reverse-engineered stuff. I believe the Validity Sensors are very different from each other. If it doesn't work after modifying the usb id (as it happened to VFS300), I hardly believe this driver would work on this device. Check this bug https://bugs.launchpad.net/ubuntu/+source/libfprint/+bug/827669 maybe you can get more info regarding this device there. Cleaned up a little more, and pushed. Thanks very much for the patch! Can you upgrade ubuntu 12.10 package ? Latest commit on git repository contain VFS300/301 driver.